Alastair is very excited to be leading Lawrence Park Tennis Club’s coaching and programs for the upcoming season. He and his team are thrilled to be given a chance to add to Lawrence Parks already stellar reputation and help to make LPTC’s player development programs some of the strongest and most enjoyable in the city. Alastair has been Director of The Supreme Court since the organization began in 2014. 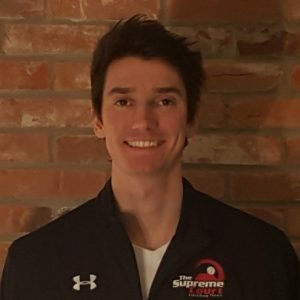 He is one of only eight “Tennis Canada Club Professional 3” certified coaches in the country as well as being a certified “Tennis Canada Coach 3”. Holding both accreditations makes him one of the 5 most certified tennis professionals in Canada as of January, 2017. The “Club Professional 3” designation is Tennis Canada’s highest certification for club management and facility development, while the “Coach 3” course is a High Performance coaching designation specializing in long term athlete development, making Alastair an expert in tactical, technical, physical and psychological tennis fundamentals. On top of this, Alastair is also certified as a “Tennis Professional” by the United States Professional Tennis Registry along with certifications for Wheelchair Tennis and Cardio Tennis. Alastair has produced top 10 U10 players in the province, top 5 U12 players in the country, U12 provincial champions, has developed internationally ranked U18 players, has toured internationally with ITF / WTA ranked players and most importantly has coached hundreds of club players at every level over the past 10 years. Alastair is currently the Tennis Director at The Supreme Court Indoor, a four-court, year-round facility in North York, as well as being Head Tennis Professional at Davisville Tennis Club, an OTA award winning seasonal club and is also a High-Performance Coach at Advantage Tennis International. Alastair has been published in Tennis Ontario Magazine and hosts The Supreme Court Tennis Podcast, the most watched tennis podcast on YouTube. His previous work experience involves being Head Tennis Assistant at Kew Gardens Tennis Club, coaching at Wanaka Tennis Club in New Zealand, The Boulevard Club, Tennis Canada’s U10 National Training Centre Program, Toronto Tennis Academy, North York Tennis Association and is honored to have coached (along with Ben Armstrong) 2015 Parapan Am Games Tennis Doubles Bronze Medalist, Joel Dembe. Please let Alastair or his staff know how they can help make your experience an incredible one at Lawrence Park! Valerie began her tennis career at the age of 5 in Kiev, Ukraine where she fell in love with the sport. Currently, Valerie is a Tennis Professional at Donalda Golf and Country Club and is a Ontario Tennis Association Club Professional 2 Candidate. Valerie has a wealth of experience at Community Clubs and was instrumental to the success of Moore Park’s adult and junior programs during her tenure as one of the club’s Tennis Professionals. On top of her coaching and playing achievements, Valerie is currently involved with Tennis Toronto. Valerie loves to be on the court and would love to help you achieve your tennis potential!